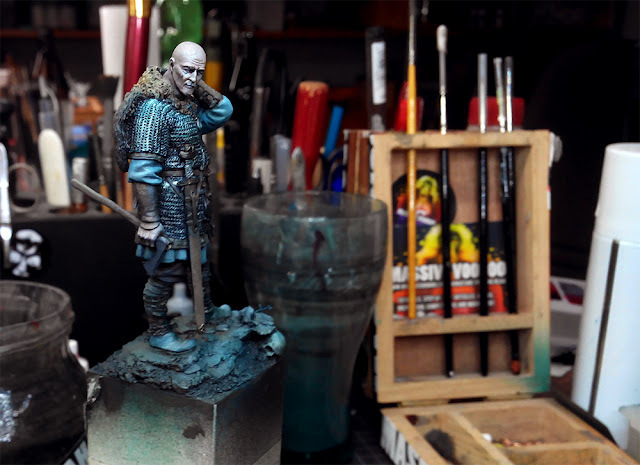 this week's tutorial voting saw a really close contest between two cool (and blue) articles. This article will be #317. Crazy, but time to go full viking now! - Where is the miniature/bust/character? At the beach, in the forest, desert temple, jungle, troll cave etc. - What time is it? Is it night- or daytime? Which light color influances my atmosphere? In fact these thoughts result from my recent way of painting freely without making me headaches while I plan my project. I paint freely with this, wild and free. 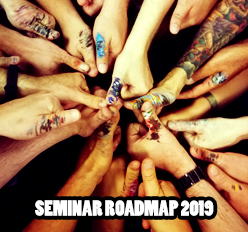 It is also a topic I explain in detail in my MV's Jar's Advanced Class and in many private coachings to come. I will try to give you an insight and a glimpse into the topic by explaining it on two Viking models I painted up some weeks ago in kind of the same atmospheric setting. This is not a true step by step showing you each step I have done. It is more an insight into my thoughts while working these models into a cold atmosphere. Step by step kind of, but still with enough big steps to keep you thinking, not repeating blindly. I want to excuse myself for a mix in the photo quality of this article. Some were done with my mobile, others with my digital camera and even some with the big camera, but I am pretty sure you get the point of this article. 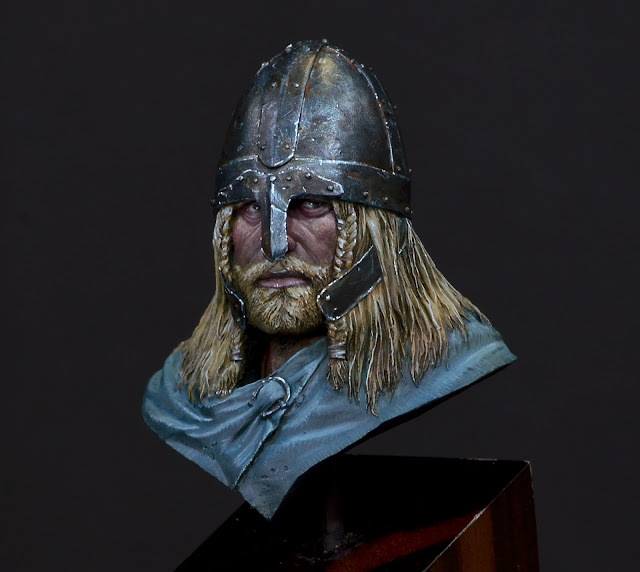 "Rolf" by Castle Miniatures in 75mm and a small tiny bust by Nocturna called the "Viking Raider". 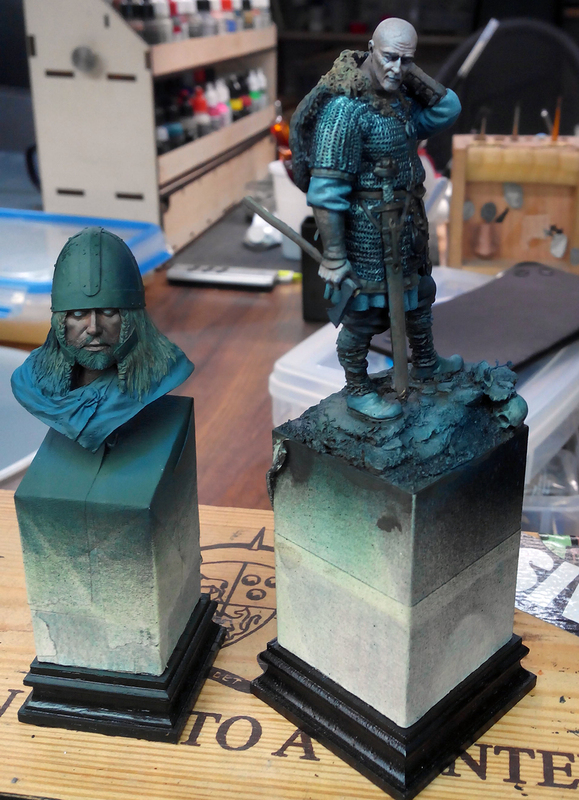 Both on a plinth by Dino Pivato, prepped with masking tape to keep these beauties from color harm. 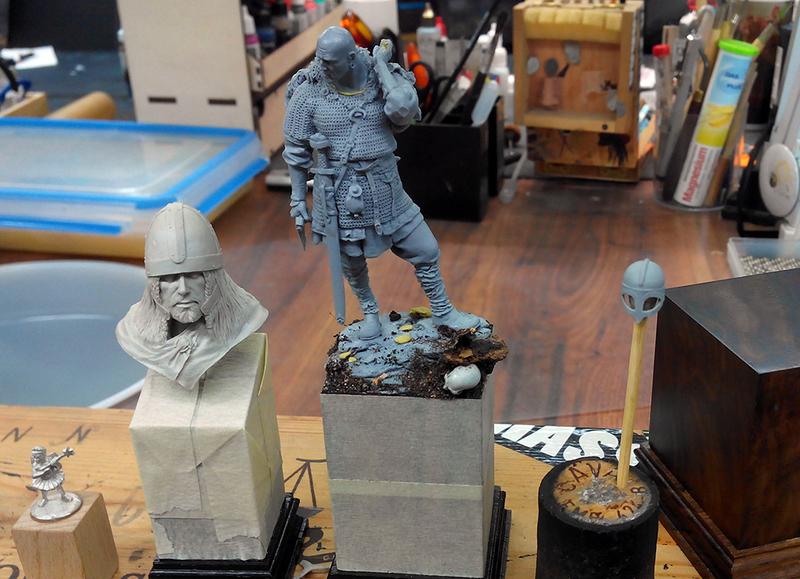 The resin bust preps and pinning to the plinth went quite easy while some areas on Rolf had to be taken care of with the use of Milliput. 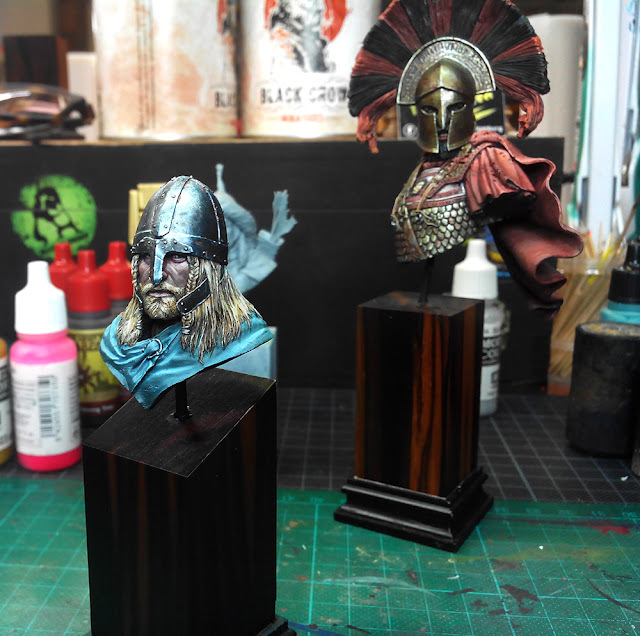 Additionally I prepared Rolf's helmet on a toothpick, stuck to a cork and did the same to his shield, as these pieces needed to be placed later on. Now comes the important part to keep it cold. 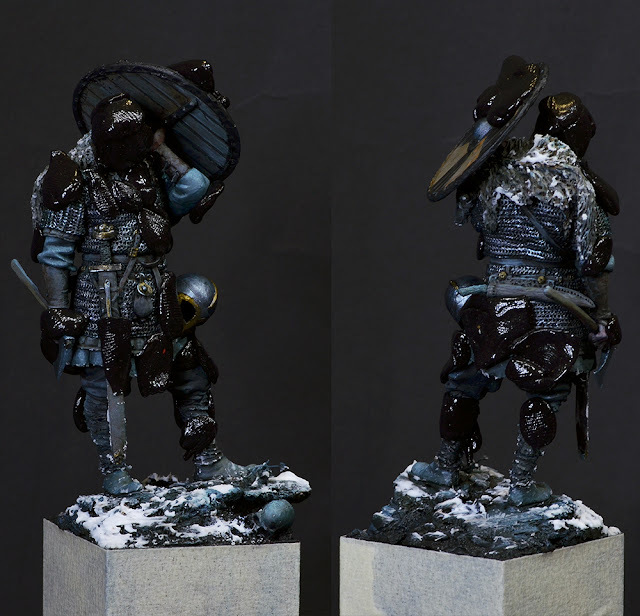 It is time to apply other basecolors to the models for example leather, metallics, skintone, etc. What I did to keep it all in the same atmosphere was adding a tiny drop of the same overall blue into each basecolor. Applying basecolors is always a very important step, but also exhausting and boring. Stay focused on it and prepare your basecolors well as an opaque surface you can work further on top. If it's an unclean surface with not being opaque it might lead your furthermore paintwork to look strange if unclean areas in your basecoat shine through. Well, you can also use this to your advantage when it comes to very textured or structured areas. 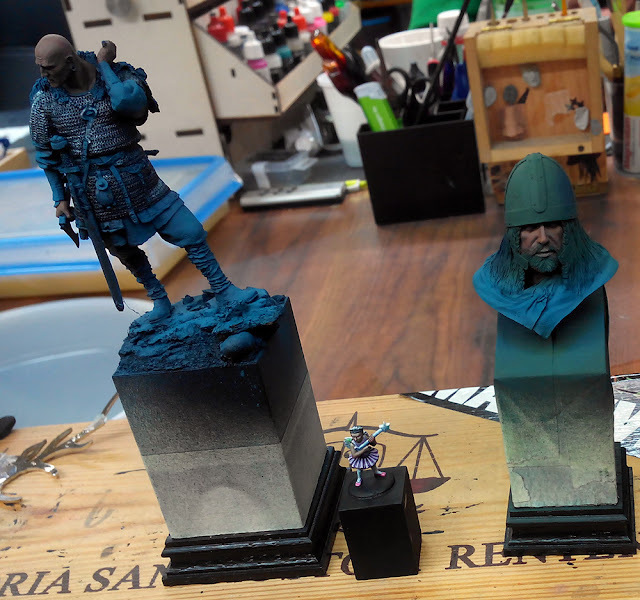 I did not paint both models at once. No one can do such. 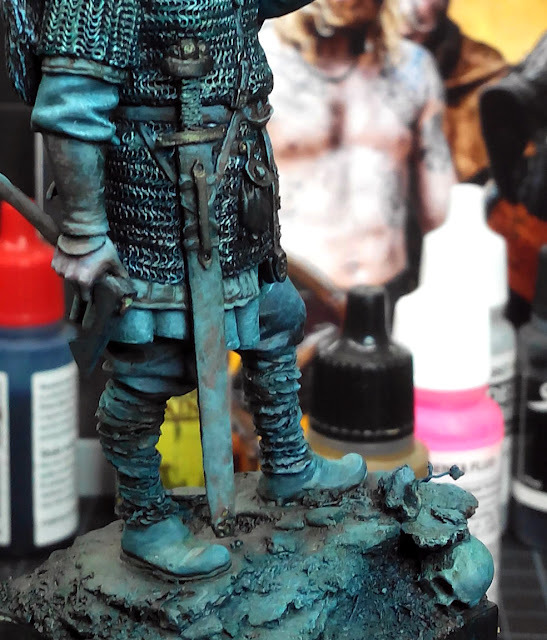 I started to paint on Rolf and switched over the Raider here and there. I try to do the same in the explanations. 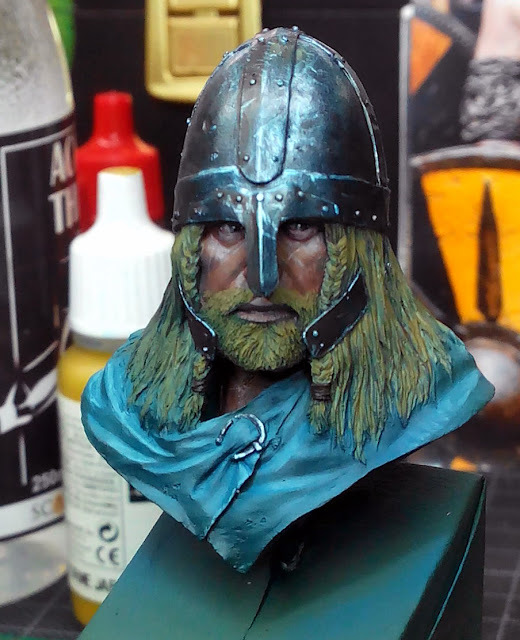 Same thing happend on the bust, but much slower and with a slightly different warmer basic skintone. I did not use pure white for the eyes of the bust, it was a little off-white with a drop of red, green to it, but also a tiny drop of blue from my atmosphere color. I went a little further in my sketch. 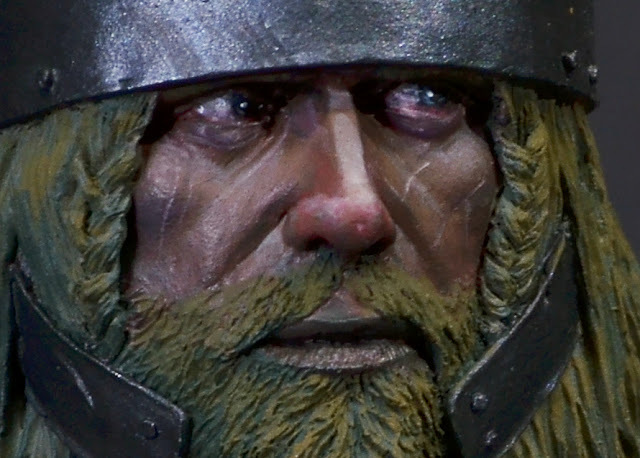 Painted the eyes, glazes for skin color variations, first shadows and highlights and rough texture. 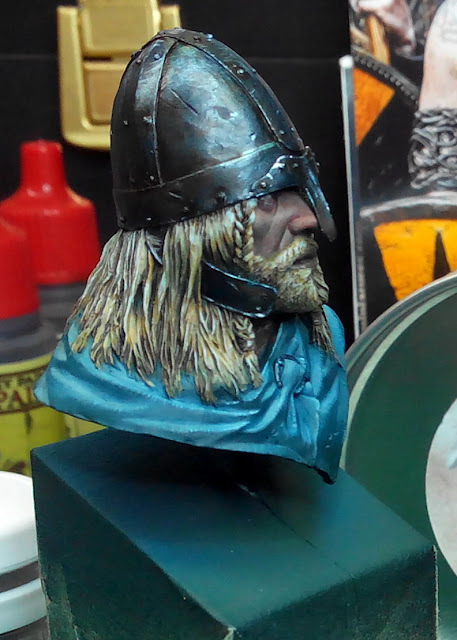 Also added the base color for the blond hair, but well - again - blue to the mix. Makes them look green, weird for the moment, but well in the end one atmosphere. After this step is done I start to intensify the different materials a little more. Bring back their original color you can say. Different brown glazes and washes on the leather, reds on the skin, a black controlled wash on the chainmail, a highlight here and there, a stronger shadow here and there and a little more texture over there. This will change the overall atmosphere look once more, but no need to be confused, just stay focused, it still works well togehter. The sketch grows. Overall look still good, even different colors appear, all cold. Keep it cool! 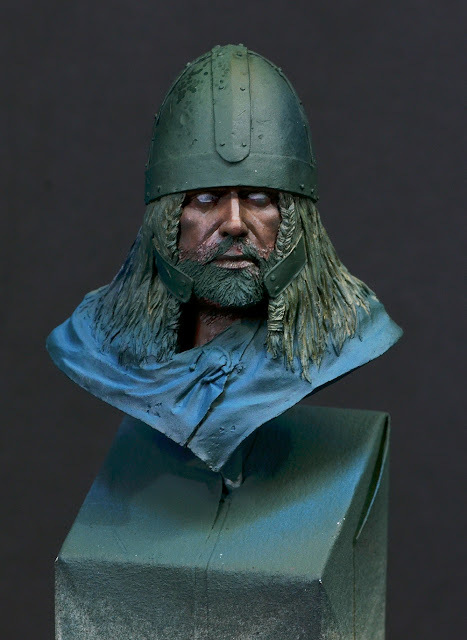 While I was working my way through more and more details of Rolf I also came upon the shield. 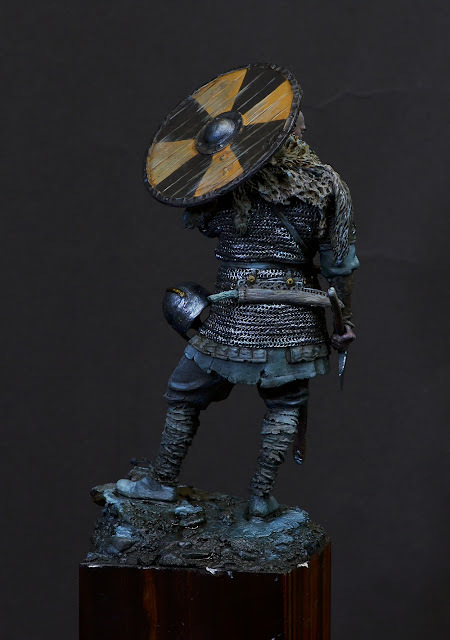 I decided for a yellow/black shield, but again if I would place a strong, powerful yellow here it will stand out of my atmosphere way too much. 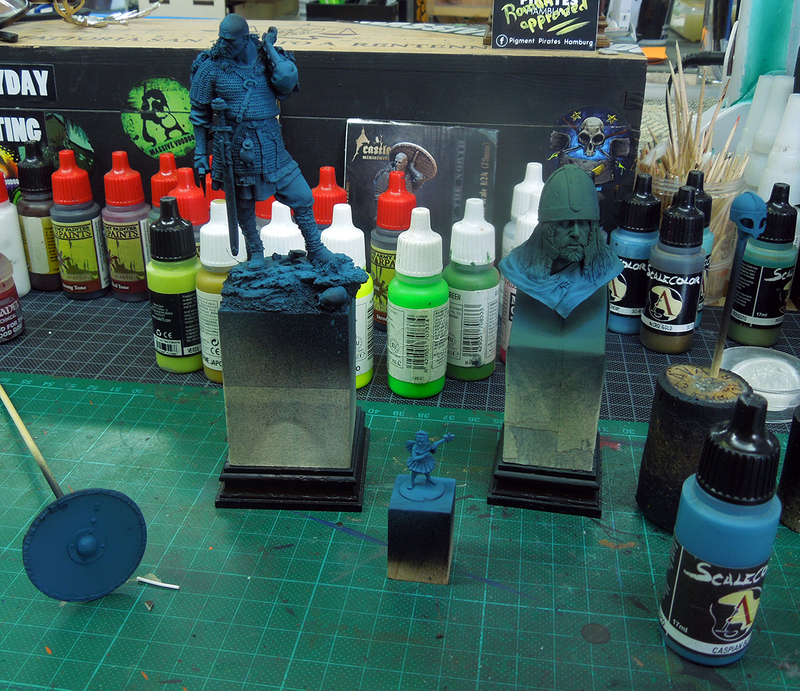 I have to add blue to the mix again, even for its base color. Same to the black by the way. I added snow to Rolf, just a little bit and with it I wanted to bring back some more of my atmosphere to pull it all together even more. I took the airbrush once more, mixed in a thin glaze of blue and sprayed this to the overall model, but before I did I used masking putty to cover areas I did not want to have more blue. I wanted these areas a little more intense in their tonality. Pffftt! Pfffft! With this step also some of my highlights and shadows turn blueish once again. Subtile. Everywhere, except where I placed the masking putty. Tricky, eh? I kind of did the same steps to the Viking Raider bust. 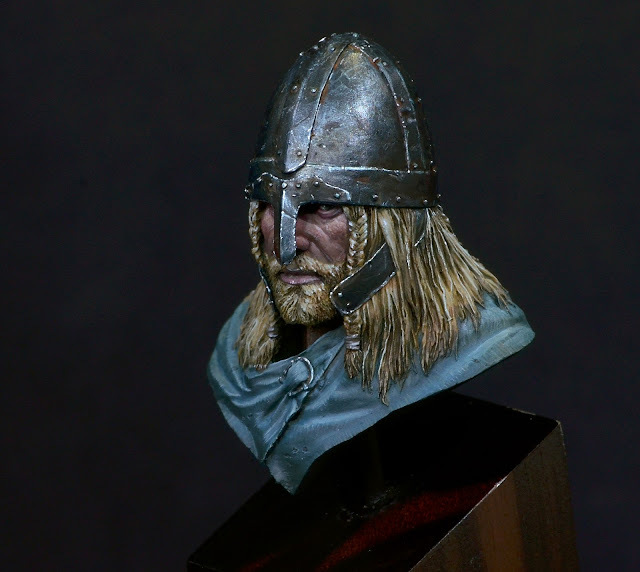 What I also did on the metallics and wasn't able to explain properly on Rolf's photos: While highlighting the metallics I used a bright silver with a blue touch. 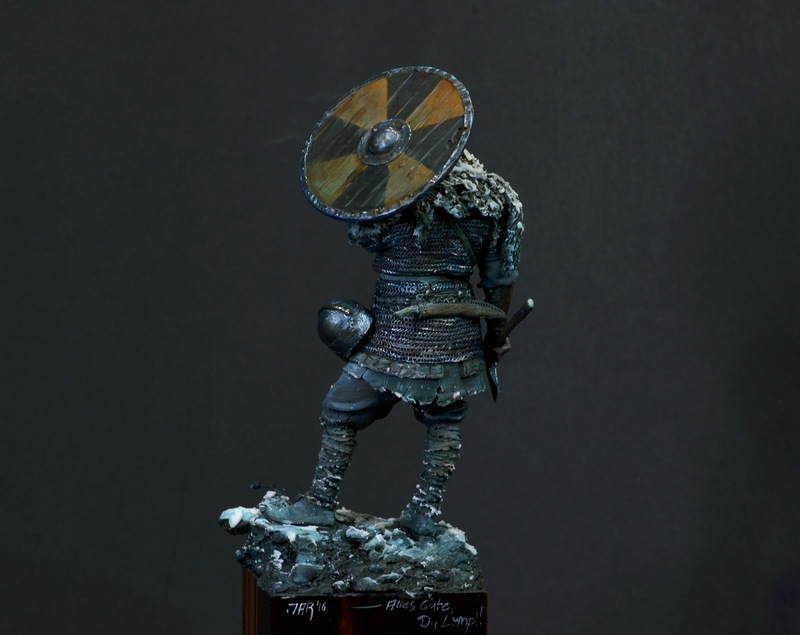 You can buy such from Scale75 or just take a silver and mix in a drop of blue to it. You can see how I added textures to the metalls by stippling and thin lines, crossed ones or just single ones. As metallics in nature are a material that reflects its sorroundings pretty strong I aimed for blueish highlights in the metals and some brown midtones to brownish dark black shadows. 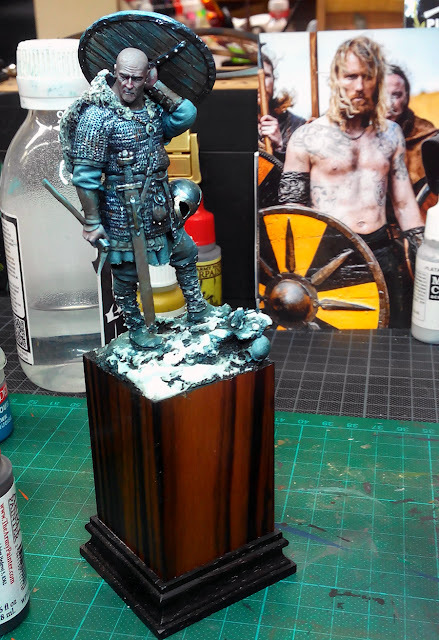 I did this with applying strong tone (makes it matte again, so additionally recieve a contrast in my metals between matte and shiny), followed by strong tone plus a drop of black for the deepest shadows. 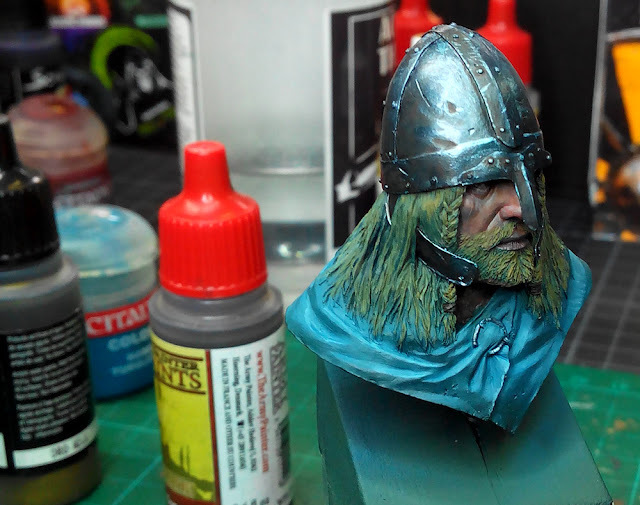 Compared to the photo above you can see how I also started with cold highlights in the hair basic color to keep really everything stick together. 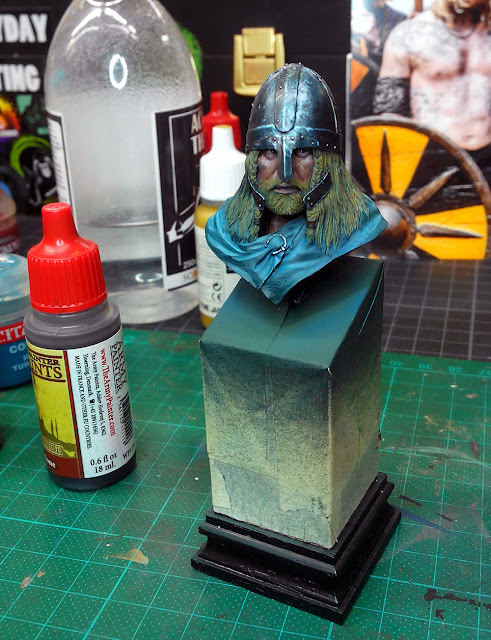 When I decided the bust was done with main work I removed the tape from the plinth. I love this moment when the beauty of the plinth comes together with the one of the paintjob. In the back you can spot another paintjob, which was done in not a cold atmosphere setup, but in a ... guess what? 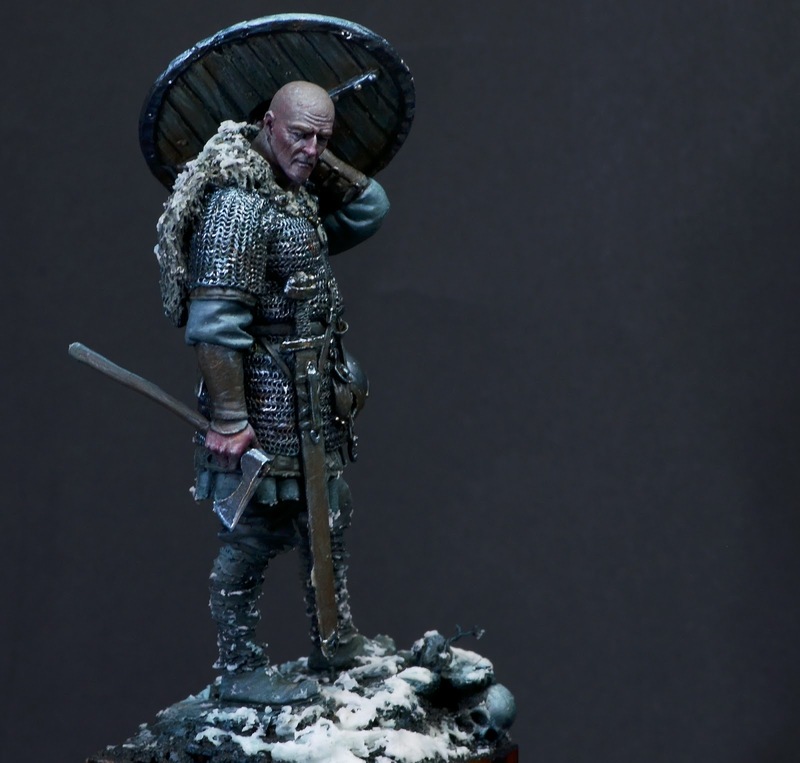 Both models - these two cold vikings - were a lot of joy to paint. The structure of my atmospheric work schedule keeps me kind of free from recipes. I add what needs to be added to stick to a specific atmosphere. On both models I might have done some small edge highlights here and there and some color variations here and there to make it more interesting, before I called them done. 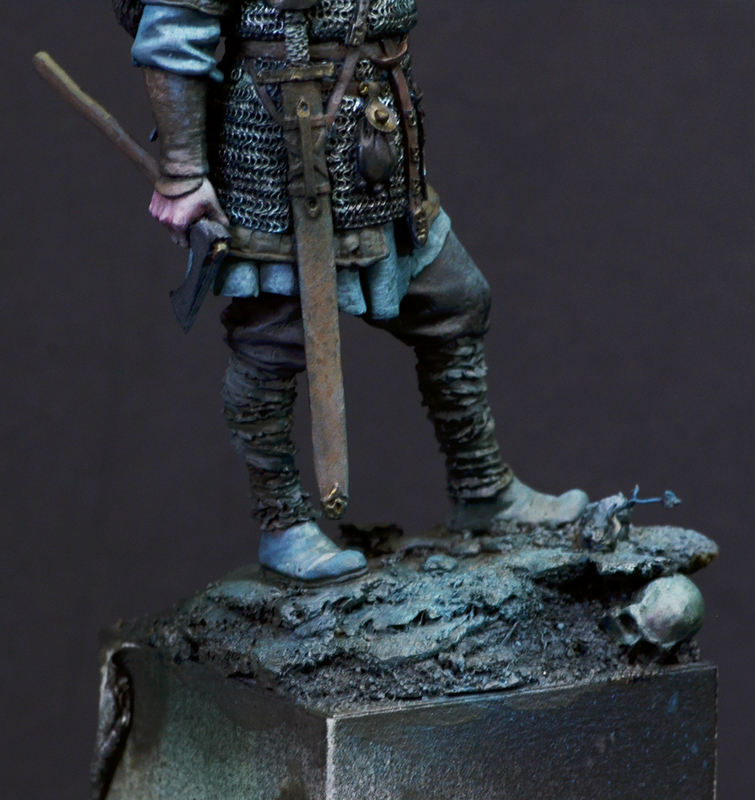 If you want to see more photos of Rolf, that I called "Erik Reimundson", please follow the link to Putty&Paint. If you want to see more photos of the Viking Raider bust, please follow the link to Putty&Paint. I hope you enjoyed the insight into my progress on these two. I hope my thoughts are understandable. Give it a try, do not fear. Keep on happy painting! If you like to support or say thanks the monkeys of Massive Voodoo in what they do, please feel invited to drop a jungle donation in their direction via paypal or check their miniatures they got on sale here. The Viking Raider bust is on sale there two! Make it yours! I am curious. Did you spray blue on top of the snow effects too? Thanks for the feedback. Happy that you enjoyed the article. Great article Roman. I'm gonna try this blue highlight sometime.